A few months ago I had heard about a solution Cisco was working on to provide developers access to the modular interface on the AP3800. Cisco, for awhile, has had some sort of modularity in their high end AP but it was reserved for future standards or Cisco specific solutions. The AP3600 provided a module slot capable of supporting an 802.11ac radio, the AP3700 supported the Hyperlocation and WSSI security module. The AP3800 will also be supporting a BLE module but the big benefit comes from the ADP Hardware Developer Kit. The ADP exposes connectivity to the AP3800 via a breakout board. This breakout board provides pin headers to attach varius Small Board Computers (SBC), Xbee radios, and ethernet ports. This allows developers to integrate solutions directly into the backhual and power of the AP. For example, an organization supporting building systems running off of Xbee radios could build a module that provides the building systems network while using the AP as backhaul reducing the number of cable runs and PoE ports required. One thing to take into consideration with this though is that it is using the AP’s wired backhaul, depending on the traffic generated by your module you may need to consider utilizing multigig capable (mGig) switches. As you’ll notice this is a HDK, not a final product. 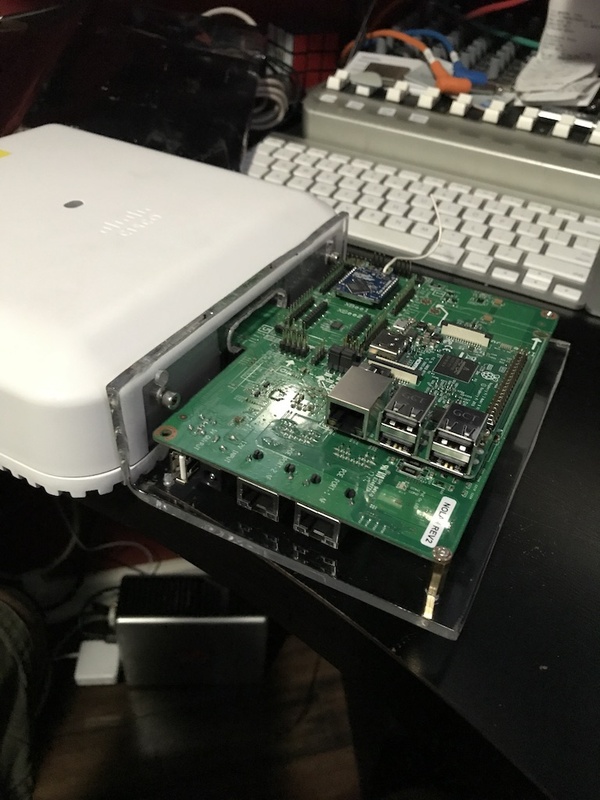 Cisco has published a 3D printer file that you can use to create your own tray to mount it to the AP3800, when I received mine this did not exist however so I had to come up with another solution simply using some plexiglass and heat bending it to work as a mount. One could build their entire product off of the HDK but that is not the desired process. The HDK exposes all of the ports and interfaces allowing you to tinker and build a proof of concept. 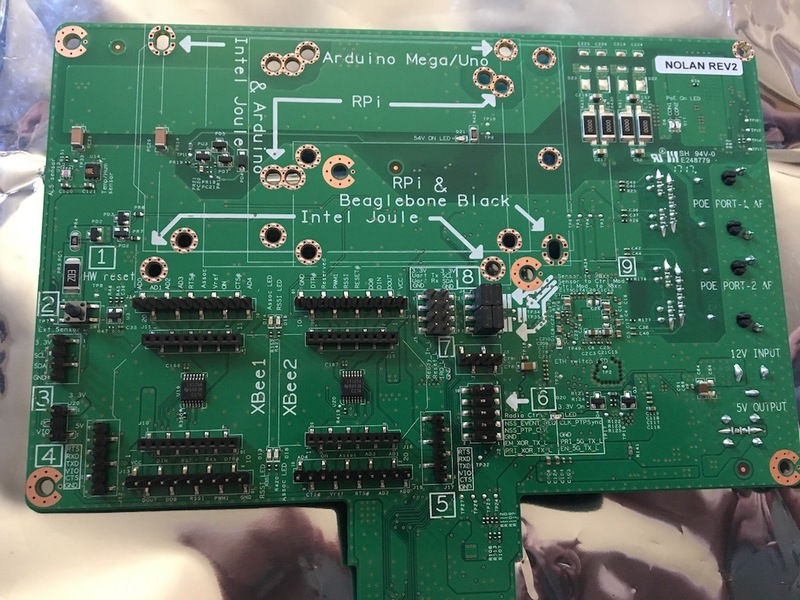 Once this PoC is built you would develop your own PCB board allowing you to reduce the size of the finished product and allow it to be more aesthetically pleasing. Because of this I worry that adoption of the ADP program might be limited, most probably would only need a board that provides connectivity for an RPi, so a smaller HDK without Xbee radios could be beneficial. So what would you use this ADP for? Well I already mentioned one use case: building systems. If you look at some of the verticals you can clearly see where use cases could be developed. In retail we could use this to provide the backhaul to Electronic Shopping Labels or Wireless ePaper Displays. We could also attach video modules to the APs to further enhance the targeted marketing experience (something I’m on the fence about). One could also imagine in healthcare we could develop a WirelessHART (IEEE 802.15.4) solution using APs to provide the backhual for those radios. Because you are in close proximity to the AP3800 you need to be careful with frequency coexistence as well as thermal properties. Where do I see the ADP program going? Right now the ADP only allows for power and backhual essentially, I would like to see where we can interact with the AP radios and datapath to a limited extent. I could foresee a module that provides iPerf testing over just the RF, something we can’t really show today. Our iPerf client can be wireless but our server always has some sort of additional latency caused by it being a wired device, imagine if we could hairpin the iPerf traffic out the module slot and not ever have that traffic go onto the wired network. 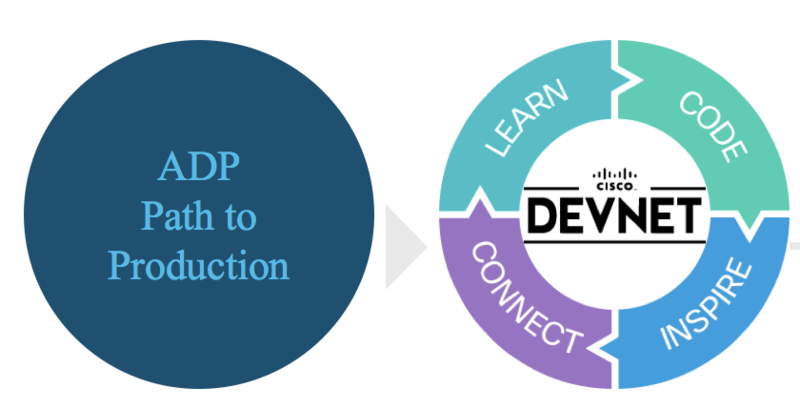 Modularity is always a great concept, the benefit this go around is that it is more of an open program allowing for others to bring modules to the market that possible Cisco wasn’t considering nor should they really focus their time and efforts on. While my Python is quite rusty it has been an interesting journey looking at what I could do with the module and I look forward to seeing what others come up with using the ADP.